We are organizing a survival fishing workshop, to be held on Saturday, March 5th, 2016 at Tomoka State Park in Ormond Beach, FL. The event will start at 10 am and it is FREE. If you are interested in participating, please register by filling out the form and at the end of the post. This will be an introductory hands-on workshop on handline fishing. No fishing experience is necessary, we’ll loan you a Yoyito fishing kit along with instructions to get you going. You’ll learn how to cast, retrieve and with a little bit luck, catch a few fish. We’ll also teach you how to obtain bait, use found items as lures and make flys with readily available materials. Upon request, I or someone else in the group can show you how to clean and prepare the fish, for cooking on an open fire or grill depending on availability. We made a trip to the Park on Friday, February 20th and took some pictures for those of you who are not familiar with the location. 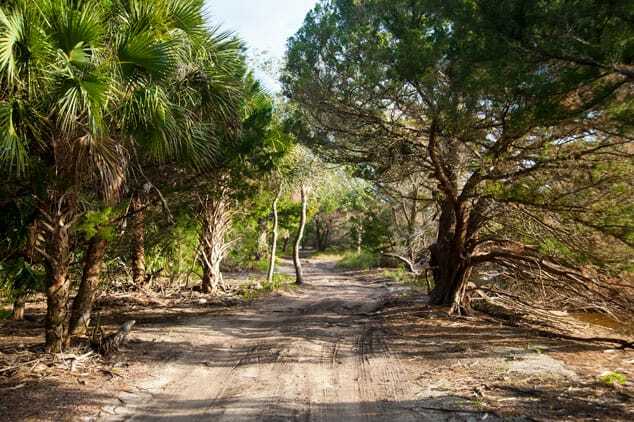 There are several dirt roads like this one throughout the park, making it very easy to explore by car. There are also several hidden little spots like this one, with picnic tables, grills and what looks to be a small fire pit. The vegetation is lush and reminiscent of a Jurassic era, you can easily imagine, dinosaurs walking around the area. Or native Americans, going about their business, preparing their dugout canoes to go fishing. 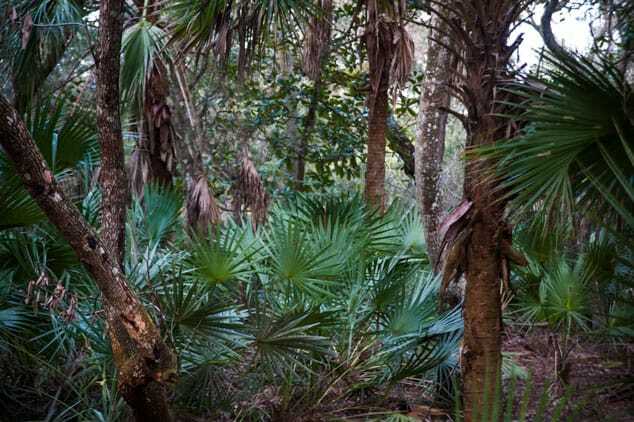 The combination of Sabal palms and Oak trees creates a fairly dark undergrowth, but it is not too thick to traverse. 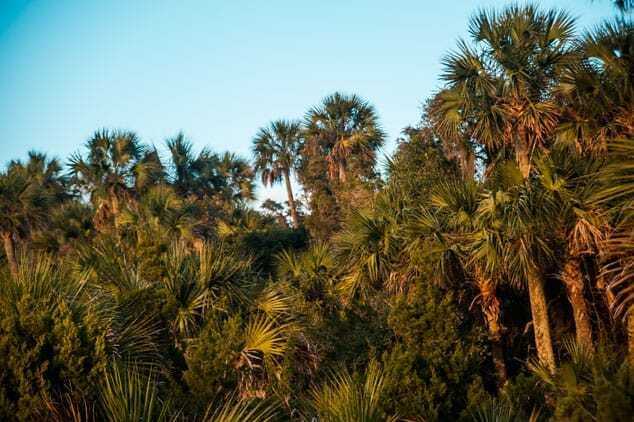 The Sabal palms are everywhere, some of them are very tall and lend an air of mystery to the place with their trunks like backbones of some giant beast. 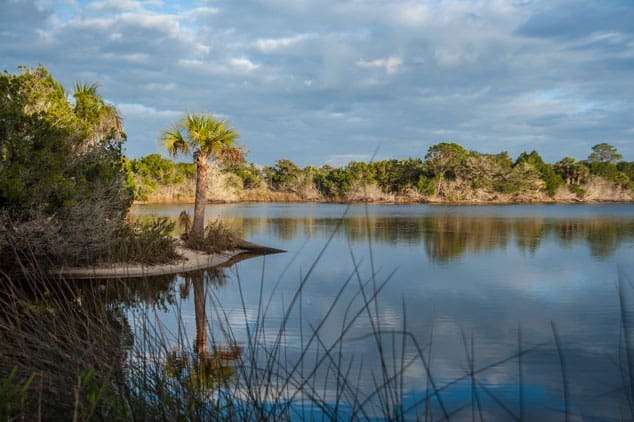 Between the lush vegetation, you can peek into the shore of the Tomoka river, and almost everywhere are good places to fish from shore. The finger covers tend to be protected from the wind and provide for beautiful still water, the surface of which is regularly broken by jumping mollets, whom have travel the oceans and returned here to spawn. 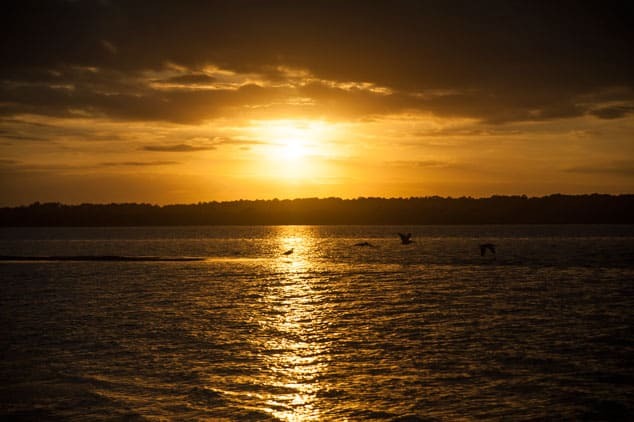 The later afternoon glow, as the sun slowly creeps behind the horizon sets the sky on fire on the Tomoka shore. 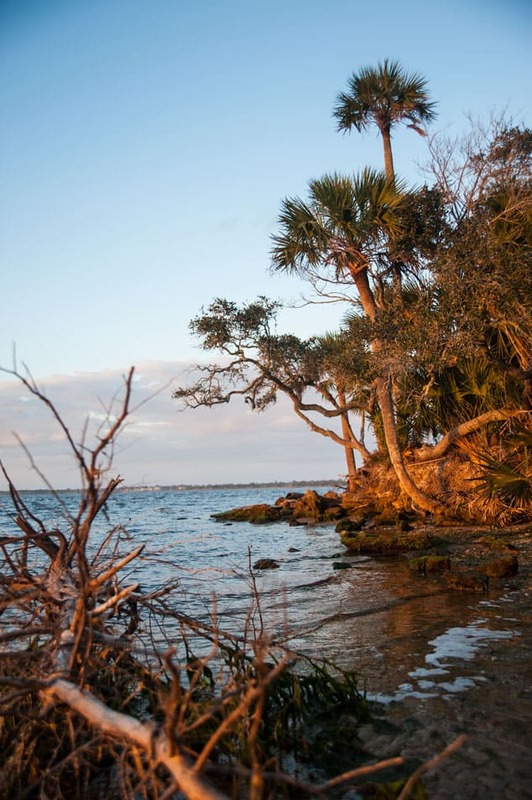 The very North side of the park, where the Tomoka and the Halifax river meet, has very interesting rock formations, there the vegetation, crooked with roots exposed tenaciously clings to life as the ebb and flow of the tides wash the earth away. Kidding aside, this park is really beautiful and the sunsets are spectacular. Please note, that Florida requires that anyone who wants to fish, obtain a saltwater shore fishing license. However, if you are a Florida resident, you can obtain the license for free, if you get it at a store or the tag agency. If you get your license on the internet or by phone there will be a $2 – $3 service fee. 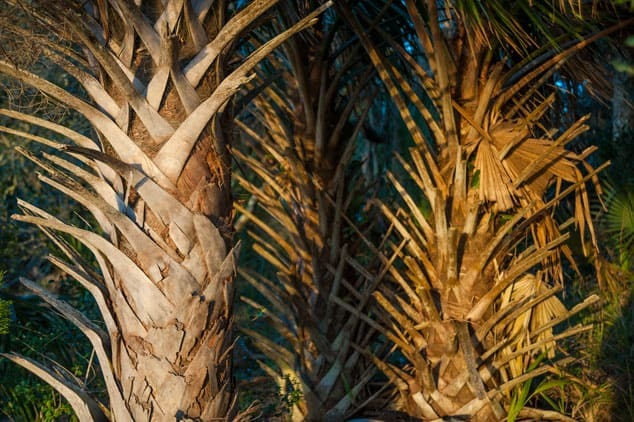 For more information visit the Florida Fish & Wildlife Commission’s website by clicking here. This is not a formal setting, think of it more as a get-together, where people with a wide range of fishing skills, sit around and trade stories, tips, recipes and build friendships. The plan is to meet at the very end of the park, where the Indian statue is. This is where we’ll hang out for about two hours, from 10 am to 12noon and get everyone set up with enough knowledge to be able to catch some fish. I can provide some background on handline fishing, and share some of my techniques, but I will also be very open to learning from all of you. Around noon, we’ll break for lunch (please bring your own snacks and beverages). There is a little store in the park with some food and there are shops and restaurants within a short drive. After lunch, everyone is welcome to explore the park and find a spot they like and fish the rest of the day. 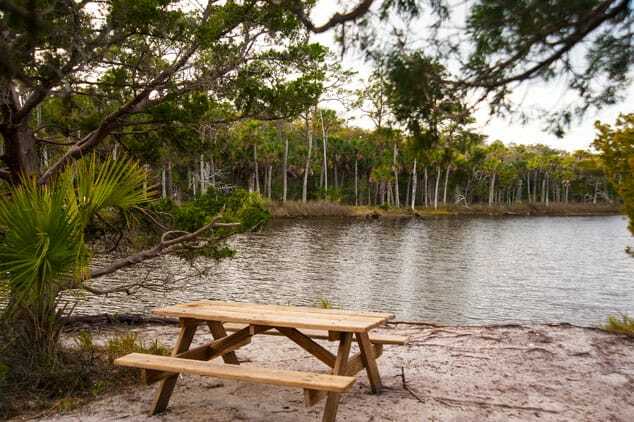 There are many little coves, and hidden spots throughout the entire park that make for great fishing, many of them have picnic tables and grills. I also notice, that several of the spots I checked out, also have signs of small camp fires, but we’ll have to check with park officials to make sure it would be ok to do this. I’ll take some BBQ briquets and starting fluid for cooking and demonstrations, but please bring your own if you plan to grill. 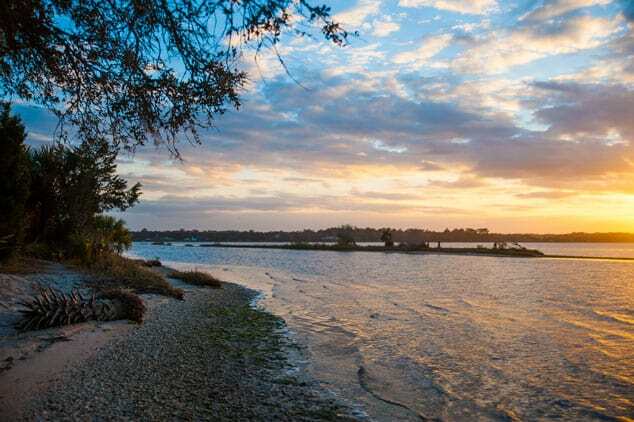 I’ve caught many fish in this area, including redfish, snook, tarpon, black drum, mollet, mangrove snappers and catfish. With the various cold-fronts, we’ve had, the fishing might not be too reliable as this tends to disrupt their routine, but the old faithful catfish is usually always around and ready to take a hook. When you are done fishing, we ask you to please return the Yoyitos and tackle to me. However, if you find that you liked using it and want to keep it, you can purchase the kit at the discounted price of $20. The main reason we are organizing this workshop is to introduce folks to handline fishing and provide a lifesaving skill. A lot of people are into emergency preparedness, and they usually have some global catastrophic event in mind, but I’ve been very poor and I can tell you, that people can easily find themselves in a situation where knowing how to fish for food can really improve the quality of their lives. Besides, it is a great way to spend quality time with the people in your lives that matter the most. 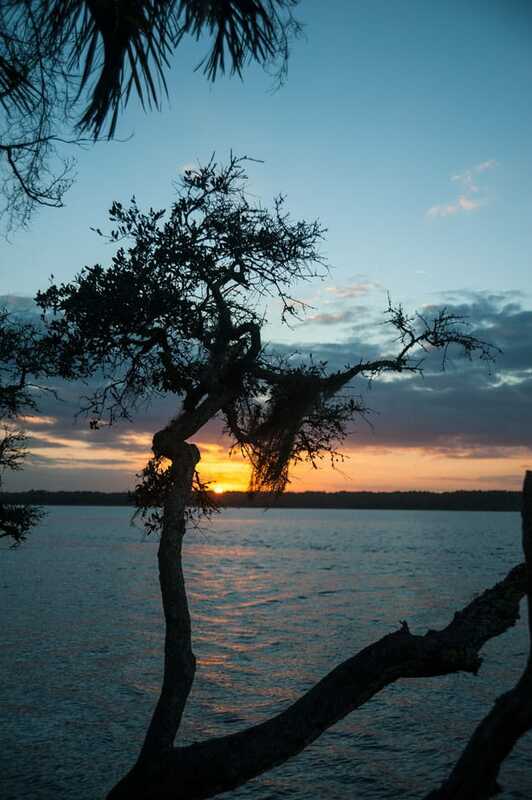 The park closes at 6:30 pm, but they have campsites that you can rent if want to spend the night. By the way, I highly recommend you do this if you can. If you stay, you can fish overnight and early in the morning, which is a great time to fish because that is when most fish are active. Make sure you call the park ahead and make reservations, their campsites fill up pretty quick. Another important thing to note is that even though the workshop is free, there is a fee to enter the park. The cost is between $4 to $5 per car, depending on how many people are in the car. 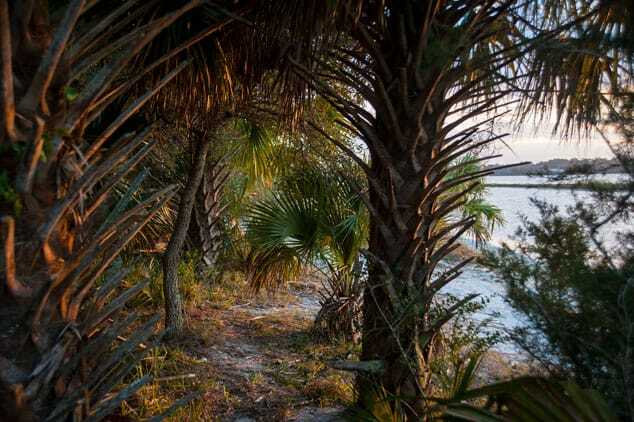 Click here to visit the Tomoka State Park website for more information. You’ll find the park offers many other activities besides fishing and camping. So if you want to learn how to fish, visit a beautiful park, spend a nice afternoon fishing, or just make new friends, please consider attending this workshop. If you are coming, please fill out the form below so I can get a good headcount and plan accordingly. If you have survival skills, like knowledge of locally found edibles, cooking in the wilderness, handline experience that you want to share with the group or simply want to pitch in, please let me know in the comments section of the form and I will contact you by phone.